Santiago is one the places that must be seen if you are visiting Chile. As the capital of the country, this city will give you a great initial taste of the local life. Some impressive characteristics of Santiago include its street art, the local busyness of the centre and the stunning sunset views. The best part is that you can visit the city in only one or two days if you are in a rush. One of the things that impressed us the most about Santiago is that the whole city is surrounded by mountains all way round. This triggers beautiful colours in the sky at sunset and sunrise times that you cannot miss out. Find a high spot and enjoy the colour-changing sky at its prime! 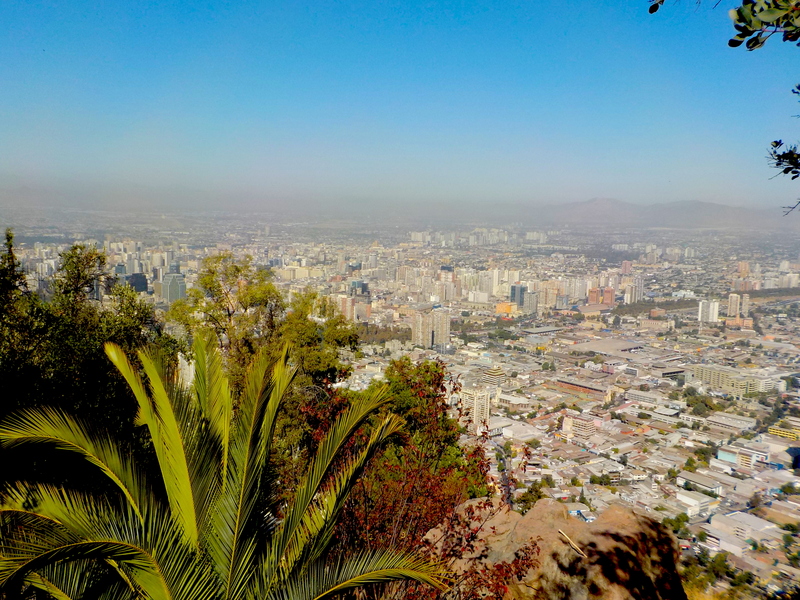 The Metropolitan Park stands at one of the highest points in the city from where you can see the whole of Santiago from the sky. This is a must-do stop not only because of the stunning views but also because there are lots of different activities that you can do here. The Park incorporates a zoo, trekking paths, a praying sanctuary and a few public swimming pools. The park is situated at the north of the river at about a 20 minute walk from the centre. You have the option to do an hour trek to the top of the mountain or you can take the very chilean funicular for only $1,500 or $2,000 return chilean pesos – which is about £2,3GBP or $3,3US for a return ticket. The Heart of Santiago is situated in a square called Plaza de Armas, where many busy streets connect. It was great, as tourists, to wander around the busy streets feeling the local environment. Nearby is the arts neighbourhood, barrio de las artes, which combines a set of calm streets also very nice to walk around with some art shops and galleries. If you have time, we also recommend that you explore the streets slightly outside of the centre. We found the street art to the fantastic in the north side towards the metropolitan park. The walk alongside the river and the parks that surround it are also lovely. If you are into museums, there are a few in the centre that I am sure are worth a visit. Unfortunately, the only day we had time to do this was on a Monday, when all public buildings were closed. So if this is something that interests you, try to avoid visiting Santiago on a Monday so you don’t miss out!